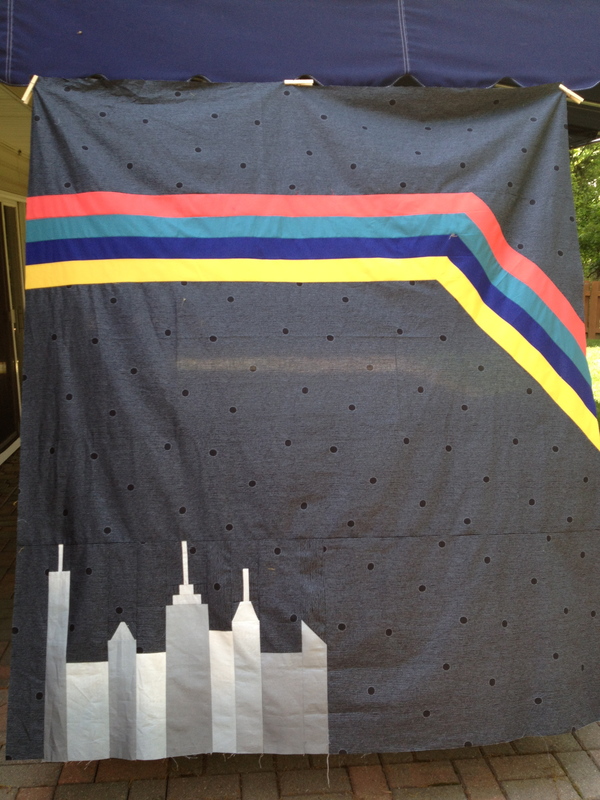 This week I’ve been quilting the new skyline quilt. It’s about 72 x 86, bigger than anything else I’ve done. I’m so excited to see it coming together. I did some straight lines with my walking foot in the stripes and some all-over FMQ square meandering loops for the negative space. 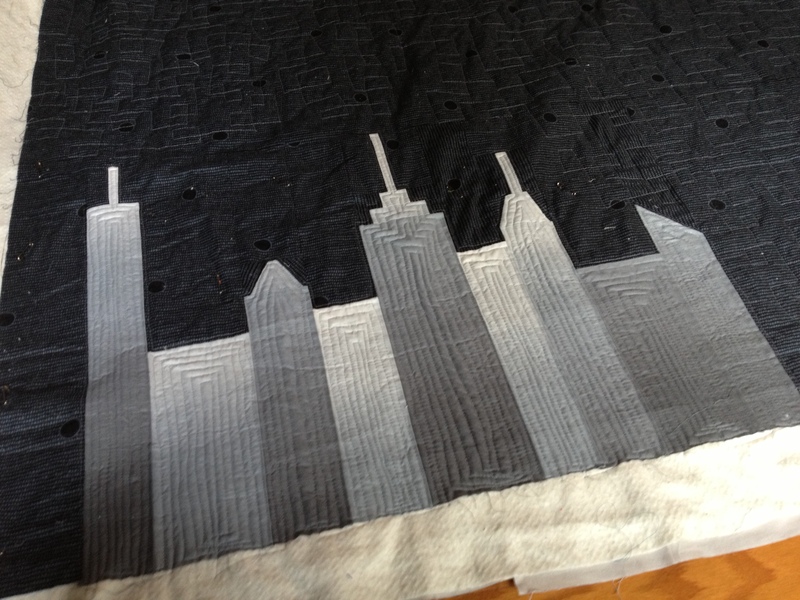 My favorite part of the quilting is the skyline. I started outlining each building and then echoing the shapes until they were all filled. I originally thought I would use the walking foot for this, but thinking about pivoting the entire quilt for every angle pushed me toward free motion, and I’m so glad I did it that way. It was kind of like coloring, so much fun. It’s kind of hard to see the thread, but this quilting isn’t meant to be showy, just to accent the overall design. 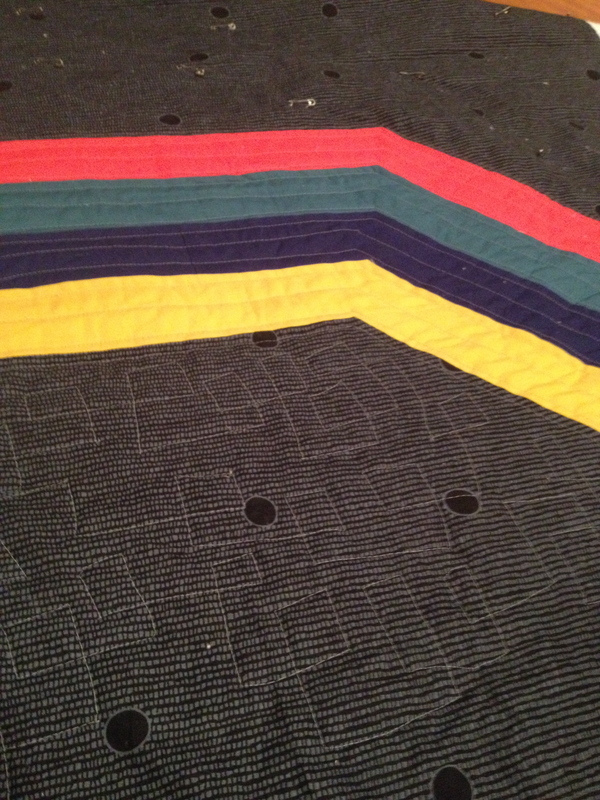 I’m using a medium gray, Gutterman 110.This Instagram filter showed the quilting on the back a little better. I still have to do the negative space above the stripes. I’m thinking about some radiating lines. But I need to take a little break– I was not thoughtful about how physical it would be quilting a big quilt, and I strained my neck and upper back a little trying to power through and get it done quickly. I needed a little self-imposed down time. Thank goodness for some great TV and books. I’m reading David Sedaris’s latest and watching Veep, Breaking Bad and my summer fave, So You Think You Can Dance. That show makes me so happy. I love the quilting. My arms/back ache just thinking about it. Good for you for taking a break! I love SYTYCD…too bad we got rid of cable a few months ago. The quilt is phenomenal and I love that dot print, sets the whole thing off with some terrific drama! Thank you so much! I love quilt drama. Veep and Breaking Bad are both definitely in the “rated R” category, unlike SYTYCD. I would hate to be responsible for any unwanted TV-viewing drama, if that’s not your style. Stunning quilt Melanie! The quilting in the skyscrapers really emphasizes them and I love the fabric you picked for the background. Hope your neck/back are feeling better soon! Thanks so much! I just needed a night off and some heat on the neck and shoulders. Quilting usually relaxes me, but I was nervous about the design and the size and totally tensed up. love. love. love. i love the meandering squares, i love the buildings, this is going to be awesome. i can’t wait to see it all – the back especially 🙂 btw, this thing is huge! looking forward to seeing you next week! Thanks! Looking forward to seeing you too. When are you done with school? 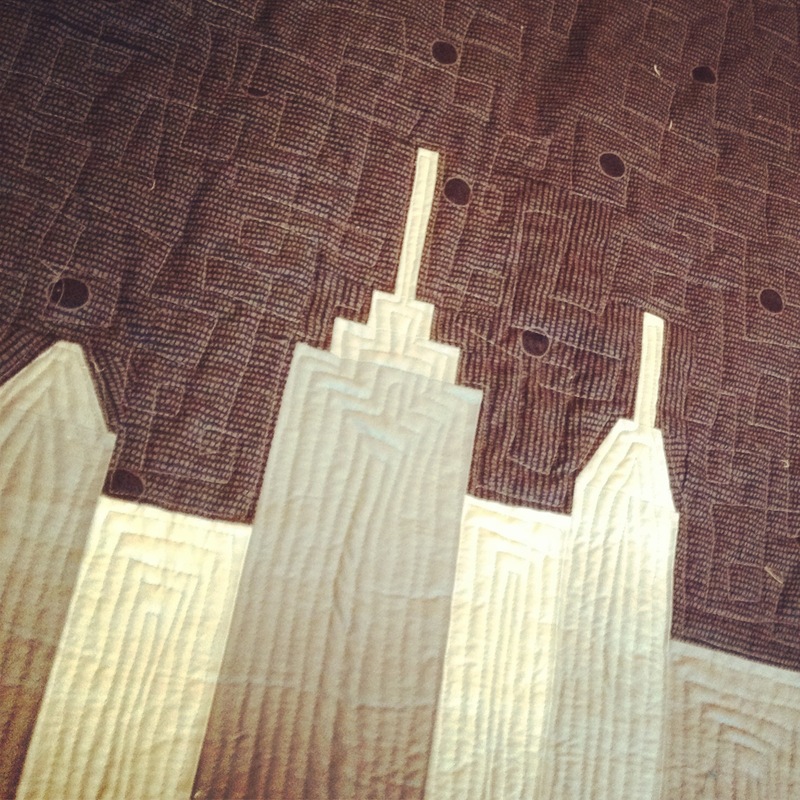 What a great skyline and the quilting really sets it apart. The square spiral on the ladder dot background is perfect too!